To start, it was a very nice town and community were class was held. Then, coming to your classes with a warmth welcome and arranging meals for us was very generous of you and the program. What I value the most was the enrichment of the knowledge you presented and transmitted to everyone in the class. All of our questions were just answer and a few were just presented with resources. Wonderful. Know let me tell you what I personally was nutrient about the course. The importance of a plan, should be to prevent anyone from getting ill when consuming our distributed product, we Patagonia Foods have taken it serious know. It just starts with us been motivated and do our diligence with following our given guidelines. Good Manufacture Practices on the facilities we buy products from, reviewing if they are complying with the Preventive Controls, follow procedures on Allergens, Foodborne Pathogens, Critical Limits and what is been done on Hazard Analysis and their preventive controls. For us to follow up with every provider that we work with is essential and mandatory. We will strength up our Recall Procedure and strength up our structure protocol. Continue with more exercise on mock recall inviting our providers and our clients to participate. Our purpose is to sell safe and delicious foods to our clients and we all are responsible for getting it done. Thank you for the resources, tools and knowledge you shared with all the attendees. 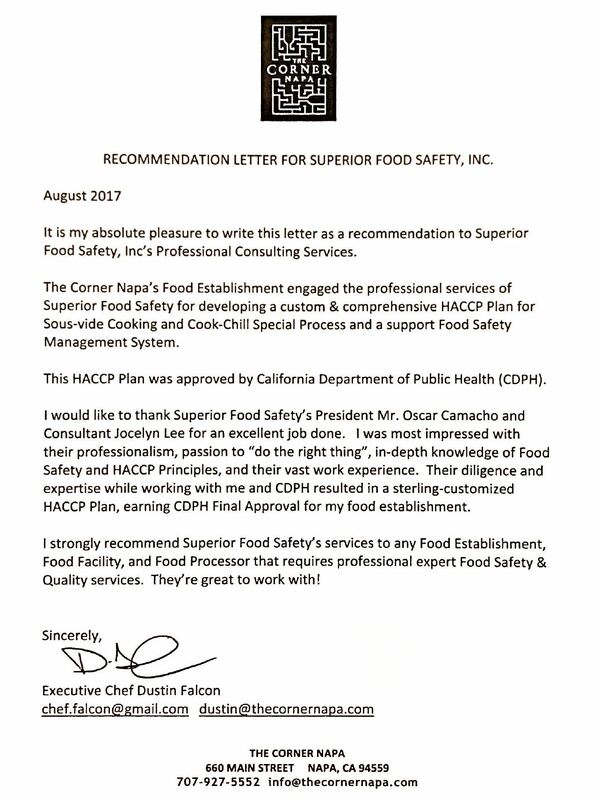 “Cocoa Services West is pleased to recommend Oscar Camacho and Superior Food Safety for SQF consulting services. Our plant received a 99 score on our first SQF audit and we could not have achieved this without his training, support and his extensive knowledge of Food Safety. “Reference is made to the above mentioned training which you conducted at State Garden Inc. on 12/11/14 and 12/12/14. We learned a lot and shared experiences in best practices for internal auditing, key performance indicators (KPI’s), continuous improvement and Corrective Action / Preventative Action (CAPA) process tools. The various examples you used and the interactive nature of the training were very helpful. The knowledge and skills gained will be invaluable as we strive to continuously improve our Level 3 Safe Quality Food System. Thank you for the training. We look forward to having you again for more trainings." “After attending Safe Quality Food 1000 and 2000 training with Oscar Camacho the system is now a clear and obtainable goal. Our company can now proceed with the implementation having the necessary tools to complete the process with a common sense approach. Mr. Camacho is able to present the system from an obviously experienced stand point because he has actually had experience from the primary grower to highly complex food production industries." “Evans Food Group and its affiliates are committed to manufacturing delicious and wholesome products that meet and exceed our customer’s expectations. In our constant quest to exceed our customer’s expectations we are working on achieving SQF certification for our plants. We have had the privilege of working with Mr. Oscar Camacho who is very knowledgeable in SQF systems as well as a great trainer and motivator. On behalf of our group we would like to thank you for your guidance and providing us with the tools we need to achieve SQF Certification and continue to be leaders in our field." “Oscar Camacho is very knowledgeable in the SQF systems. He was able to review our SQF systems and gave positive feedbacks and recommendations on the action items we needed to achieve certification. I would highly recommend using Oscar’s consulting services to achieve SQF certification."